Now that my SolarFire Astrology software is updated to v9, I'm in process of reviewing some of the older horoscopes I've worked with through the years and finding that many of them are now easier to calculate for a more precise 'birth' hour. One such is the 'Modern NWO' horoscope set for the third of three Great Conjunctions of outer planets Uranus and Neptune, the Enlightenment/Age of Reason duo, which occurred on October 24, 1993 @18Cap32. 1. February 2, 1993; 2. August 20, 1993; 3. October 24, 1993 (from 18Cap33 to 19Cap34). Now if you've read this blog of my dissenting fusses before you may know that the Sabian Symbol for '18Cap' seems to me most applicable for the so-called 'new world order' or, 'new economic order' or, Global Government, or, Zionist Earthly Kingdom at Jerusalem--whatever you want to name the luciferian global syndicate and its centuries-long 'great Plan' to take control of the entire globe. Smoosh the 'Illuminati' in there somewhere with its Total Awareness program, and you have a picture of most, if not all, of the Plan's anti-societal, depopulating, genocidal, psychopathic illness which becomes more visible in public every day. The false reality of 1999's The Matrix was pretty close to the beast and is a good example of how they use the entertainment industry to place ideas into consciousness thus making drastic changes seem more palatable later on when it's time to implement them or something very like them. Go back further than 1999 and you find Robocop hinting at Transhumanism and the current robotic, militarized Police State. So here you see a horoscope of what may be considered (if you wish!) a natal horoscope of the Modern New World Order for the power game is really older than the hills--back to Heaven, if you think that way. For astrological purposes, its genesis can be dated at various times in history with events such as: the beheading of King Louis XVI, the founding of America (and the Bavarian Illuminati, also set up in 1776--it's like we're twins), the Fall of the Berlin Wall, Bush Sr's invasion of Kuwait (he actually stated publicly that 'Desert Storm' "heralded" the new world order, plus, other historical dates and events you care to name. Such events are signposts along the way and to them may be added previous Great Conjunctions of scientific genius, Uranus, and elusive Neptune, planet of spirituality and mysticism--but also of deception of the masses. 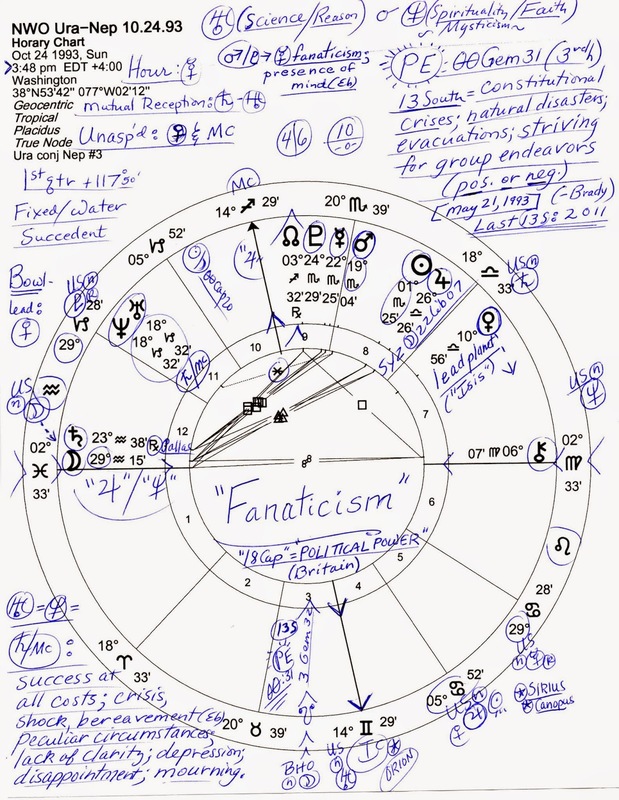 'Fanaticism' is the title I have given the horoscope (and the Syndicate of zealots and criminals it signifies), not the least because of the toxic Pluto-NN duo of violence, brutality, infiltrators, security breakdowns, secret treaties, pacts, deals, and the use of clandestine information and data-gathering. It's the "tiger by the tail' duo with karmic Pluto, god of Hades, sporting his invisible mantle of power and hidden wealth, and using the Jupiterian point of encounters and meetings, NN, as his contact with the public and with his minions and infiltrating agents and assassins. Machiavelli is twerking in his grave. 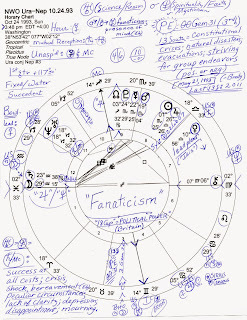 2014 into 2015 Planets Affecting the Chart: Destiny of the Masses? Of note in current transits is karmic Saturn soon to leave intense Scorpio and enter Sagittarius, sign of The Seeker and The Foreigner. Consolidating Saturn now travels between 9th house Pluto @24Sco29 and the North Node @3Sag32 Rx, a point of future direction, or, destiny. Now I won't take up your time analyzing all the transits and what they indicate since you can do so yourself, but I will add the midpoint picture it creates, plus, a bit more. When transit Saturn catalyzes the Pluto-NN midpoint we may expect some people to realize that relationships must be built over time and based on trust--meanwhile, the crooks and malcontents among us are more likely to express the trio's rebelliousness and rigidity which usually result in violent terminations of relationships and alliances. Another midpoint picture of importance involves the Uranus-Neptune conjunction itself: transit Pluto is within 5-degree orb of 18Cap now and for me, the timing includes the current take-over of the US Congress (as of the first week of January 2015--Jan 3rd?) by the Republican Party of radicals and anti-government plutocrats and their cousins, the monarchists. Not that Democrats aren't enablers and complicit culprits in the Great Plan--most if not all of them are--and are also descendants of the original culprits. Now that's long-range planning. And so we will do no better here than to quote expert astrologer Noel Tyl concerning the trio's midpoint picture, Uranus-Neptune = transit Pluto: "The big picture demands a certain course of action which must be followed; very little option to do otherwise." Why, this 'big picture' evens describes how political candidates are 'vetted': can you make decisions based on no facts but what we tell you? In other words, will you follow orders without refusing our tap on the shoulder and disregard the fate of the unwashed masses below you? It also denotes the tiresome political script we hear from all players in Washington DC and elsewhere--never answering questions directly--and hints at the planned program of militarizing police departments across the country, among many other things now in plain sight. In addition, a 29th-degree Moon (in critical or crisis condition--the people) at the end of Aquarius rises along with its preceding planet, Saturn Rx--a depressive pair as you know. Venus, one of the names of the ancient goddess these modern-day psychopaths worship (as did America's Founding Fathers--ex: Columbia), is the lead planet in the chart's Bowl formation which reveals their tendency to follow the feminine archetype against the mainstream of current thought and belief. The star, the diamond, the 8-petaled flower, a 'V' hand signal (not for 'victory' when a departing Richard Nixon flashed it, but for Venus)...all and more symbols signify the Founders' goddess-based religion of mysticism. So! I'll hush for now and hope that you can enlarge the horoscope to read a few notes such as the Pre-Natal Solar Eclipse Saros Series in which this abomination falls (13 South). Its degree (00Gem31) in 3rd house conjoins Alcyone of the Pleiades and if you're familiar with that area of the Zodiac you know it's a fated or karmic region of Middle Eastern stars of bullish rage that inspire revenge, beheadings, and other calamities and when activated gives all of humanity 'something to cry about'. Blog Note: you may wish to type 'Eclipses' or 'New World Order' in the sidebar Search field and you'll find lists of related topics including the May 20, 2012 Solar Eclipse, also @00Gemini; so by degree sensitivity, there's a resonance between 2012 events and those of 1993. You'll also note that the IC of the above horoscope, its Foundation Point, was recently illuminated by the December 6th Full Moon @14Gem18 of fulfillment and awareness. The IC is also where America's natal Mars-Uranus midpoint is placed in mid-Gemini with its explosive, dangerous, and warring implications. But please remember: I only study the charts and write this stuff which grumpily issues from my child-of-the-revolution dissatisfaction with how our nation is being run into the ground but I've never intended to tell you what to think.